I am addicted to cups. I love retro and unusual mugs and cups... to go with my love for good coffee. I have a lot of cups and mugs at home... perfectly fine ones... but I still have a burning desire to browse the cup and mug isles in certain shops... just in case there is something there I love. Many a time I have come home with a surprise mug purchase - to which my darling husband reminds me of the many fine cups we already have. 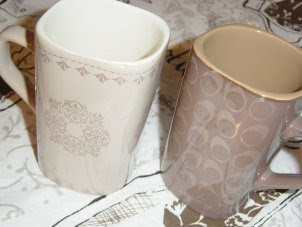 Does anyone out there share a love for mugs and cups? 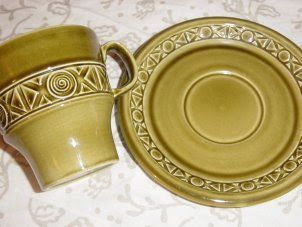 I sooooo love the green tea cup and saucer! 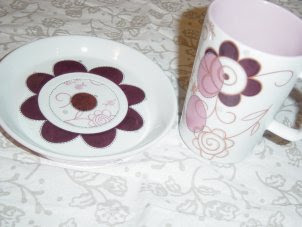 It did belong to my mum once (in the height of 70's retro fashion) and I remember the matching coffee pot that went with the set. Thanks heaps for your comment on Divas! (and the wise words you used!) Looks like you are a very talented, busy mum - love your bead creations! I too love mugs. Tea cups and tea pots are also my thing since I'm a big tea drinker. I can't wait to see your collection and have a cuppa when I'm over next!